Tattoos are more popular than ever nowadays, especially among teens and young adults. According to a Harris poll, approximately 50% of people between 18 and 40 years of age, and 36% of people between 36 and 50 have one or more tattoos. The Harris poll also reported that 23% of people with a tattoo regret getting it. Are tattoos safe? Do those who have tattoos or are considering tattoos realize the complications and risks associated with injecting dangerous chemicals under their skin in the name of art and self-expression? Every time a tattoo gun pierces your skin, the needle is opening a wound — and another pathway by which germs can enter your body. The larger the tattoo, the greater your risk of possible infection. Tattoo ink manufacturers do not have to disclose their ingredients, which includes the pigment itself and the carrier to ensure a permanent hold. So, we really don’t know all of the ingredients. Tattoo pigment dye is reported to contain: Lead, aluminum, mercury, nickel, cobalt, iron oxide, copper, titanium, beryllium, barium and arsenic. Some of the most popular pigments are those made from a type of plastic that is used to make pipes, bottles, appliance parts, and luggage. The carrier solution used in tattoo inks contain harmful substances such as denatured alcohol, methanol, antifreeze, detergents, plastics, formaldehyde and other toxic aldehydes. A 2011 study published in the British Journal of Dermatology revealed the presence of nanoparticles in tattoo inks. These microscopic ink particles can seep past your skin getting into other parts of your body and spread into the spleen, kidney, liver and lymph nodes. A 2013 Bradford University study, scientists found that tattoo inks contained cancer-causing chemicals that damaged collagen. Tattoos interfere with the way your skin sweats. If you have extensive tattoo coverage (especially on your back, arms or other areas densely populated by sweat glands), tattoos could interfere with the skin’s ability to cool your body and hold onto important nutrients. Heavy metal toxicity. The toxic metals found in tattoo ink are neurotoxic and interfere with normal body function. It is well known that lead is linked to high blood pressure, and aluminum can cause heart attacks and neurological disorders. It is especially important that those with poor methylation and those with compromised immune systems be fully aware of the potential risk associated with tattoos. If you’re pregnant, breast-feeding or planning to become pregnant, and you’re considering a tattoo, hold off and educate yourself. The poisonous chemicals in the dyes affect the development of the fetus and baby. Ultimately, the choice is yours. The responsibility is on you to prove safety since studies are seriously lacking for tattoo safety. 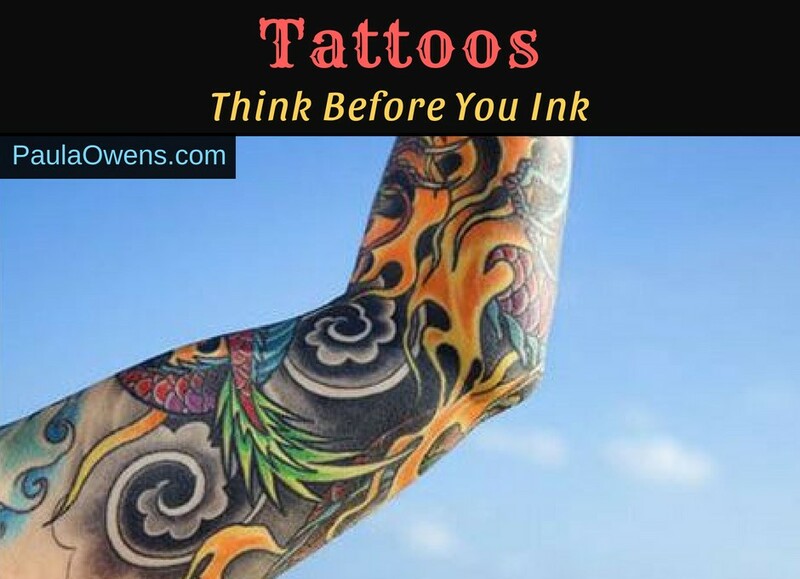 People should be aware of the unknown risks associated with tattoos, rather than presuming that the colors and ingredients are safe. Tattoo removal. With the popularity of tattoos, there has been a rise in regretful tattoos with more people wanting them removed. Tattoo removal is extremely painful and carries even more potentially dangerous risks such as dermal damage, infection, and additional inflammation. If you want to eliminate a tattoo using laser or ultraviolet light (the usual methods), the process can cause the release of toxic chemicals into your body, especially if the tattoo includes yellow #7 pigment. We all need to up our health game, take responsibility for our choices, and do what we can to live the healthiest lifestyle possible. If you have your heart set on getting a tattoo, do your homework, and think before you ink your body. Choose the safest tattoo inks available and licensed professionals. Be sure to support your body and detox safely.